If you are looking for information on the Garagetek franchise business opportunity, Garagetek franchises or Garagetek franchising, then you have come to the right place. GarageTek is the leader in garage organization systems, available in 70 markets, and backed by a 10 year warranty. Quite simply, it's the world's cleanest garage - a revolutionary concept in home improvement. How can your garage look like this? A GarageTek Makeover is the answer. GarageTek gets the stuff off the floor and organizes everything, transforming your garage. The patented materials are weather-proof, water-proof, bug-proof, and even fire-rated. You can just wipe down the garage to clean it. We Design It. A professional designer will provide a custom, 3D rendering in one short visit to your home. We Install It. 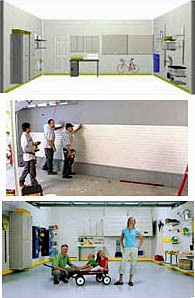 You will be amazed at how fast we can transform your garage into a useful room. You Enjoy It. Join thousands of homeowners across the country who now enjoy the new space in their garage. There's garage storage, and then there's GarageTek. GarageTek is The World's Cleanest Garage™. GarageTek uses a patented system of garage-tough TekPanel for wall storage and a full range of proprietary lifestyle accessories for organizing. By using the walls, GarageTek gets the stuff off the floor. By using movable hanging accessories, GarageTek provides permanent flexibility - every item can easily move whenever you need. With lockable cabinets, you can safely store any item out of sight. You'll smile. You'll laugh. You may even cry.